I’m first and foremost a paddler. 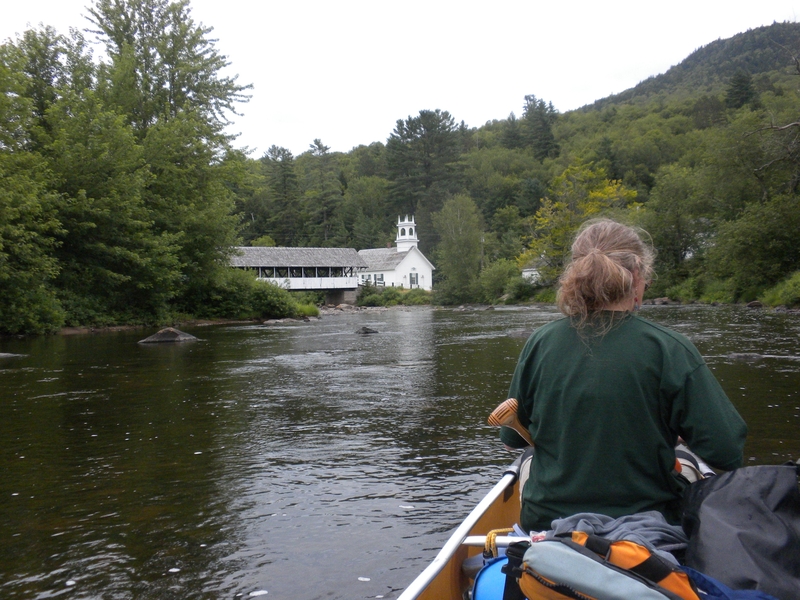 When I initially announced that I was planning a 2016 thru-hike of the Appalachian Trail, a Northern Forest Canoe Trail (NFCT) paddling friend of mine stated I was heading out on a very long portage. Just not with a canoe. Of course, I could gain instant notoriety by hiking the trail with a canoe… but that’s just crazy talk. Crossing above yet another four-lane interstate highway in Pennsylvania, it occurred to me that I was actually portaging. The protected walkways transporting hikers safely over busy freeways are not unlike portage routes that guide paddlers around dangerous waters. Interested in paddling your next long-distance trail? Here are the details. Trail Type | Thru-paddlers journey end to end, but lots of day trips, weekend getaways or week-long vacations are possible. Thru-Paddle Trip Duration | Anywhere from 4 to 7 weeks to complete. Terrain | 59 lakes and ponds, 23 rivers and streams, 3 national wildlife refuges and 45 communities. Trail infrastructure includes more than 65 portages assisting paddlers around hazards like waterfalls and dams. 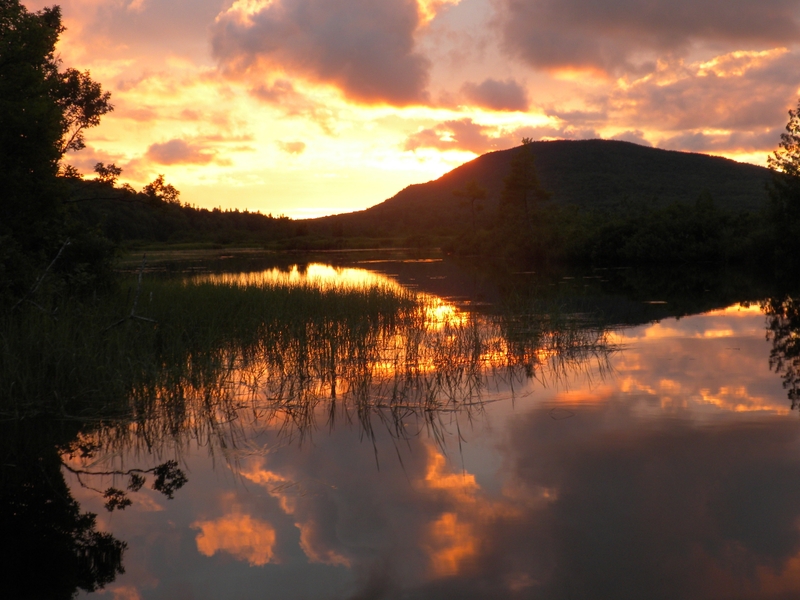 Scenery | From clear lakes nestled between the Adirondack high plateaus to rolling fields of wildflowers, from fens and farmlands to effusive rivers. The waterway winds through both private and conserved lands, between dramatic ridgelines and across expansive lakes within the shadow of Mt. Katahdin. Access | The trail begins in the Adirondacks at its western terminus in Old Forge, New York ending at the eastern terminus in Fort Kent, Maine. However, paddlers can launch their canoes or kayaks using one of dozens of access points throughout the trail. Shuttle services are available in many, but not all, sections. 13 maps break the trail down into sections. These official maps, maintained by NFCT, Inc., show GPS access points, portages, trail towns and campsites along the entire route. Build your own trip using the trip planning tool found on the NFCT website. NFCT, Inc. also produces the official guidebook that includes historic notations and side trips in addition to overall trail information. 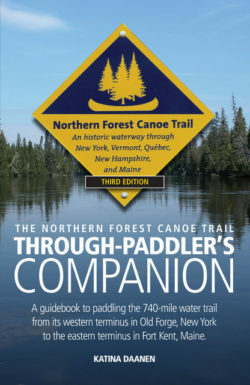 The Northern Forest Canoe Trail Through-Paddlers Companion is the only comprehensive resource that sequentially guides thru-paddlers from the first put-in to the last take-out. It documents every portage and contains additional map callouts. The 740-mile inland Northern Forest Canoe Trail is the longest contiguously mapped water trail in the nation. Officially completed in 2006, the NFCT traverses 59 lakes and ponds and 23 rivers and streams—including two nationally designated Wild & Scenic Rivers. Only the Mississippi River Water Trail can claim a longer distance, but that entire route is limited to one water body and trail infrastructure is incomplete and differs by state. 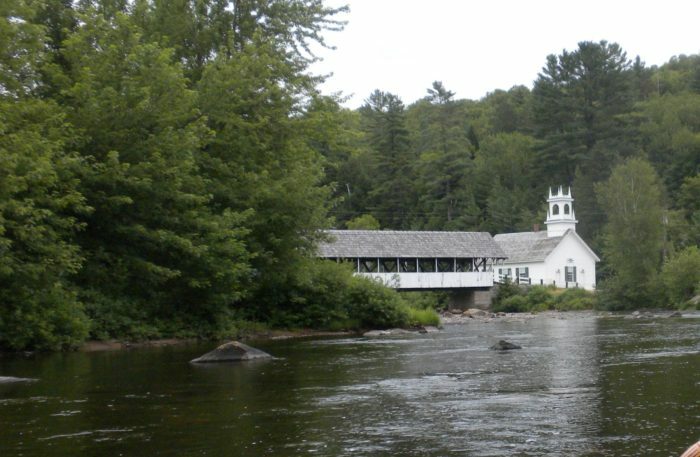 The western terminus of the Northern Forest Canoe Trail is located in Old Forge, New York and the trail traces historic travel routes used by Native Americans, settlers and guides across four states and one province. It follows the paddle strokes of Henry David Thoreau, celebrated in his book, The Maine Woods, through Chesunkook and Chamberlain Lakes, lakes located within the shadow of Mt. Katahdin and discernible from its summit. Like the portage analogy, there are many similarities that link these two trails. There are also some notable differences—the biggest being the availability of water. On the NFCT, you are on water. On the AT, you are concerned with finding and carrying it. According the NFCT, Inc., the earliest recorded successful thru-paddle start date is April 15, soon after ice-out. The latest start date is September 1. The majority of thru-paddles begin in May, most after the 10th. Spring start dates generally mean more reliable water levels, but also more bugs. *Number is based on Old Forge kiosk sign-in log indicating Fort Kent as the destination. Presently, there is no other registration process capturing this data. **Amicalola Falls Visitor Center and Springer Mountain ATC registrations as of June 24, 2016. *** The Northern Forest Canoe Trail organization annually recognizes paddlers who document their trip and travel the full trail. They maintain a list on their website. **** Lean-tos are common throughout the Adirondack section and infrequent elsewhere. In general, overnight options are available roughly every 15 miles ranging from primitive campsites to lovely inns. Why Is a Water Trail Being Profiled on a Hiking Site? 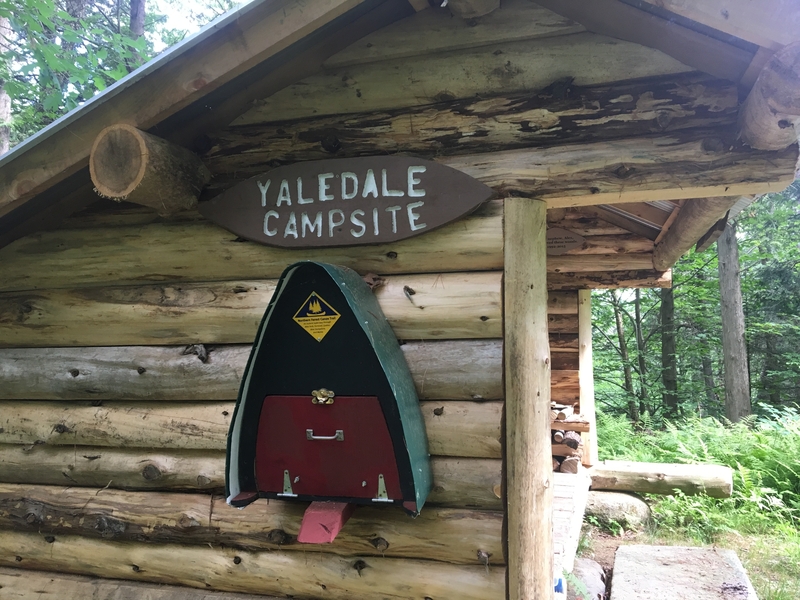 The Northern Forest Canoe Trail not only attracts paddling enthusiasts, but some Appalachian Trail thru-hikers have also thru-paddled the NFCT. A few hardy souls knocked off both trails within the same calendar year. I even sold the trail to a Northbound hiker who caught up to me just outside of Cheshire, Massachusetts in 2016. Turns out, he hailed from Old Forge and knew of the trail. We talked about seasonal water conditions, length of travel and resupply points, and before he sped off to catch the sunset atop Mt. Greylock, he decided this would be his next big trip. In spring of 2017, Future Dad did indeed complete an NFCT thru-paddle. 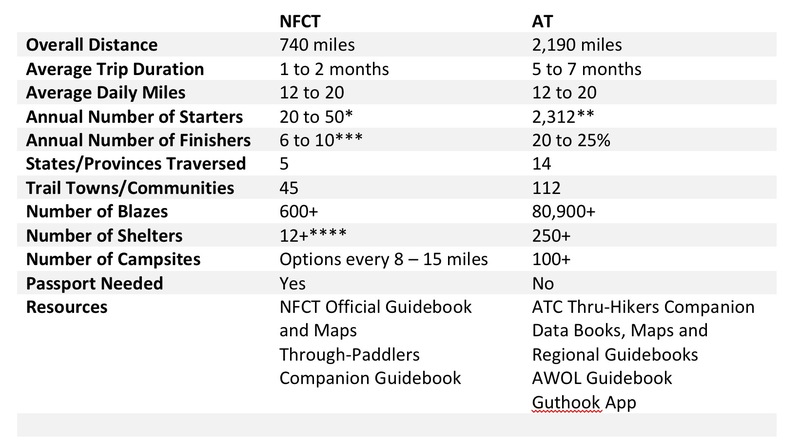 While hikers generally allow themselves four to six months to complete a thru-hike, the NFCT has been paddled by individuals in as little as 22 days and as many as 70. It took me 53 days to complete my 740-mile Northern Forest Canoe Trail thru-paddle in 2011, including six zero days. By comparison it took me 65 days, in 2016, to hike the same distance on the Appalachian Trail including three zeros and two neros. And in case you think you’d be missing hiking, those 65 or more portages total about 70 miles. Most are short in duration, but the longest, the Grand Portage in Quebec, is 5.7 miles. 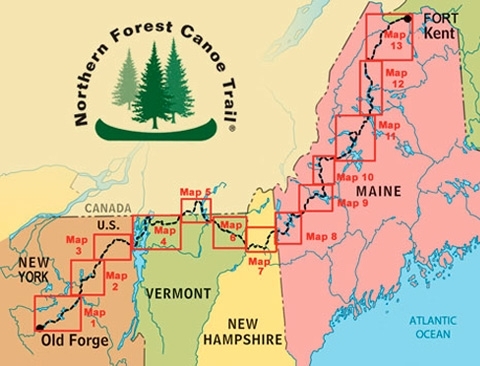 Like the Appalachian Trail, the Northern Forest Canoe Trail traverses through private, state, and federal lands. The trail passes through hills and mountains, forests, farmlands and 45 village centers including quaint Mansonville, Quebec where, oui, French is spoken. 112 trail towns are associated with the Appalachian Trail, including Rangeley and Stratton, Maine, towns also shared by the NFCT. Flagstaff Lake viewed from the Bigelows, near Avery Peak, along the Appalachian Trail in Maine. Hikers might find themselves sharing shoreline campsites with paddlers. The NFCT is loaded with picturesque campsites and the occasional lean-to. Most trail towns offer an option or two for a roof over your head. Accommodations range from primitive campsites to bed-and-breakfasts and historic hotels and can be found on average, every 15 miles or less. Where the trail traverses private land, the organization has worked with landowners carving out waterside campsites. A fine example of a trail partnership in Vermont. Conceivably, one could follow the white blazes and hike the entire Appalachian Trail without maps or a guidebook. It wouldn’t be easy, or wise, but marked with more than 80,000 blazes, it could be possible. Unlike following a 2190-mile long linear line, knowing how to read maps and use a compass is another important distinction between these two trails. 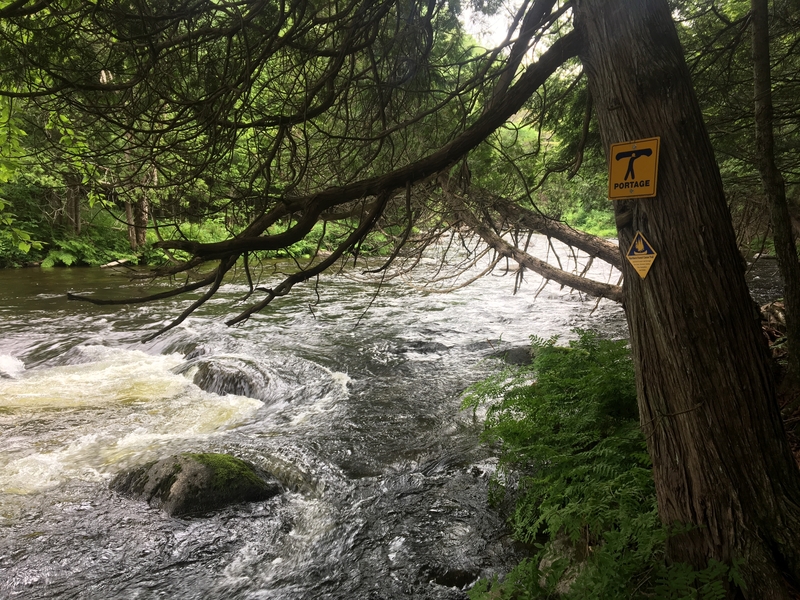 The NFCT crosses big water, like Lake Champlain on the New York and Vermont state lines and Moosehead Lake in Maine, where the only trail markers to be found are at the put-ins and take-outs—miles apart at opposite ends of the lake. Following any semblance of a line over a vast lake is moot. Paying attention to weather, direction and land formations is critical. Unfortunately, blood-sucking insects are present no matter what trail you travel, but a steady breeze helps keep voracious bugs at bay while hiking. The same wind on the water, however, can become your nemesis. A strong, although bug-less, headwind could turn into an epic struggle against heavy seas. On the other hand a light zephyr might push you along with a nice tail wind or the current of a powerful river will having you coasting and accumulating miles with far less effort than on foot. Finally, there is this: Portaging requires you to carry your gear, just like backpacking. You maintain your balance scrambling up or down boulders, just like backpacking. Each footfall is carefully placed amidst roots and rocks or mud, just like backpacking. The focus of portaging—and of hiking—is looking down. Paddling a water trail is almost the polar opposite. You sit. You look up. You focus on horizons. The best thing about both, really all, trails is that they exist. They get us outside and moving. 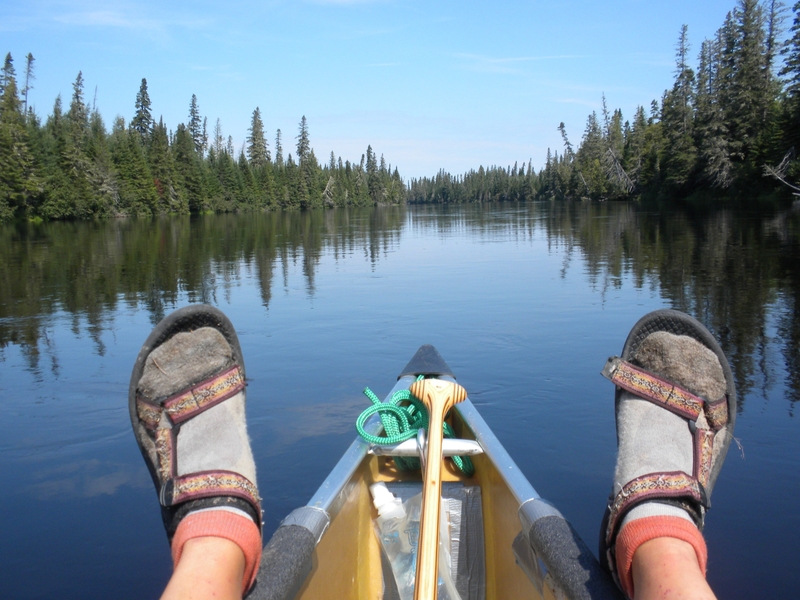 Still, odds are pretty good that your feet won’t grow a whole size up while thru-paddling and portaging the Northern Forest Canoe Trail. 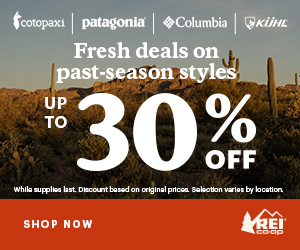 Betcha won’t be able to say that after thru-hiking the Appalachian Trail. 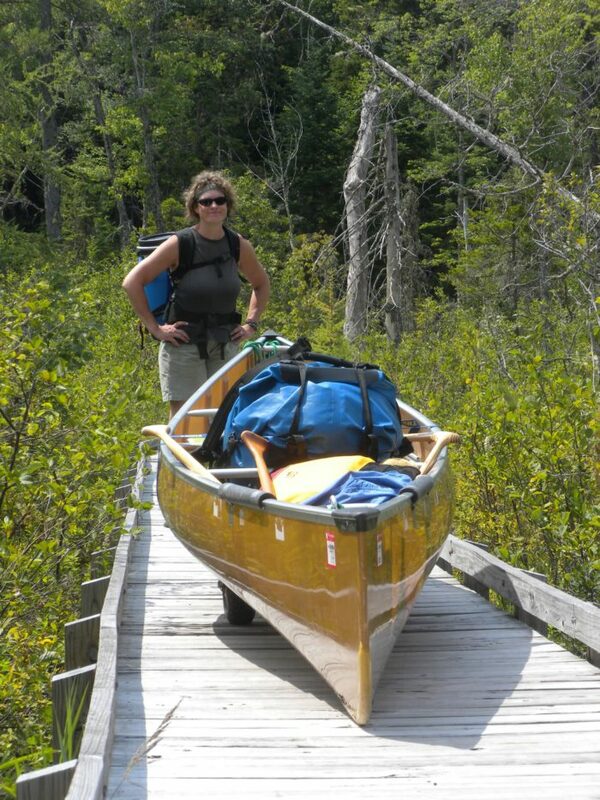 For more information and trip planning help, visit the Northern Forest Canoe Trail or nfctpaddler.com. 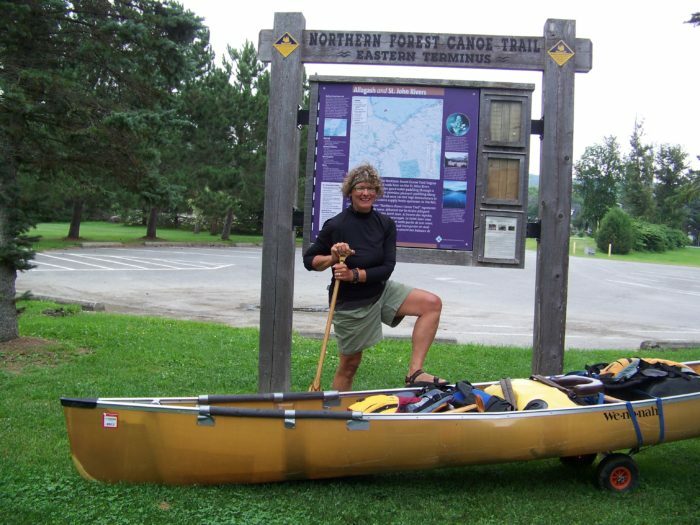 Upwards by Laurie Apgar Chandler is the memoir of the first woman to solo thru-paddle the Northern Forest Canoe Trail. The Northern Forest Canoe Trail Through-Paddler’s Companion, by Katina Daanen, documents navigating the trail in it’s entirety—west to east—from the perspective and needs of an expedition paddler, including the 160 miles of upstream paddling directions. 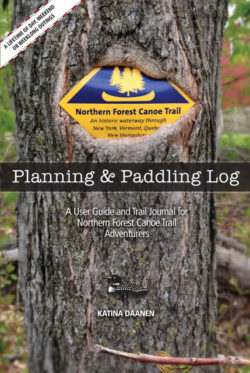 The Northern Forest Canoe Trail Planning & Paddling Log, also by Katina Daanen, is a resource for those who only have the time or inclination to experience the trail through a series of short outings or in sections. It includes more than 60 journal pages for recording trip dates, locations, distances, weather, wildlife and other highlights. Check out this gorgeous video about the NFCT from Adventureitis Productions, the same folks who brought us Dale on the Trail, the Oldest Man Ever to Thru-hike the Appalachian Trail. When I paddled the entire Mississippi River this past year, 2550 miles, I couldn’t find any woman that would even consider doing something like that, you are truly unique. I’m heading out in July to SOBO hike the AT. In addition to paddling the entire Mississippi, I’ve bicycled around the perimeter of the US, 16,000 miles, with a couple of adventures woman riding with me on various sections. We had a blast. Going up in upstate NY, (Rochester) I’ve always head of this canoe trail. Could be the next adventure after the AT. Thanks for the information and be safe on your next adventure! If you haven’t read Roff Smith’s “Cold Beer and Crocodiles,” you might enjoy the journey, considering that you’ve done something similar. Awesome. I’ve really enjoyed a couple of trips to the Quetico area of Ontario. No mountains, but a lot of lakes and rivers. This may answer the question of what I’m going to do after an SOBO AT in ’21! Thanks for sharing! Very cool! Would love to do something like this one day. I’m impressed! Just bought an Old Town Discovery 119 Solo canoe and am looking forward to the NFCT this summer, black flies and all.